Overdid it yesterday? Take it easy today. The low-key vacation pace means more time for the gym. Nothing like sizzling bacon to get those sleepyheads up and at 'em. The award-winning Wynn is a must-see, and just a mile and a half away. Minutes from the Strip, Hilton Grand Vacations on Paradise is a solid bet for families looking for a few essential amenities (pool, pool and pool), but nothing crazy-over-the-top, personal-butler fancy. Here, the sparkling outdoor pool is the main attraction, so plan to spend some quality time there, just you and the lounger, and possibly a mindless paperback. The seasonal pool bar makes those frosty beverages almost too convenient (is there such a thing? ), while the onsite Marketplace can easily persuade you to lunch on the patio. (They serve Starbucks coffee if the late nights are catching up with you.) Later on, see if you can rally anyone to head to the fitness center with you while the rest of your crew takes over the game room. Then make a quick stop back at your suite to grab whatever you plan to grill on the poolside BBQs for dinner. Rotate through your repertoire of family favorites (kabobs, steak, chicken, burgers), saving a night or two for an only-in-Vegas dining out experience – ask the concierge for reco’s. Tastefully done, one-bedroom suites are a glorious 772 square feet, including a fully equipped kitchen (with the works!) should you feel inspired to whip up something more involved than ready-to-cook items from the onsite grocery (also an excellent choice). In-suite washer/dryer will make the unpacking process a little less daunting when you get home. And the jetted tub in the master suite is bath-bomb ready – escape for an hour before it’s Movie Night time. Then gather your crew around the 55-inch TV in the separate living space and see if anyone can stay awake until the end (highly unlikely). 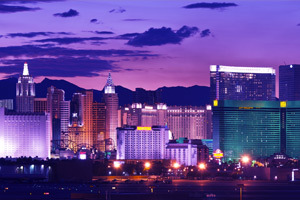 From breathtaking natural wonders to quirky, must-see, one-of-a-kind museums, there’s so much to do in and around Vegas, it can be overwhelming, but the full-service concierge team can help you narrow things down. Here’s a starter list: hiking the stunning Red Rock Canyon (over two million visitors a year! ), helicopter over Hoover Dam and/or the Grand Canyon – or check out the Pinball Hall of Fame, Neon Museum, or Mob Museum (the official National Museum of Organized Crime and Law Enforcement – who knew?). Cancellation policies may vary depending on the rates or dates of your reservations. - The resort charges a deposit total of the amount of the first night stay plus taxes. The deposit will be refunded upon departure.